The artwork takes the phenomena of New Worlds and literally turns it inwards. 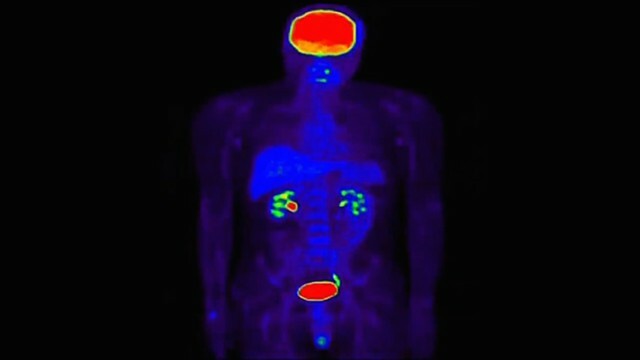 The recent science of Positron Emission Tomography (PET) scans reveal colours that create new maps, new ways to read ancient cellular structures. The tapestry of the big bang unfolds in each new cell. Whilst our gaze has always been to the sky for search of other life - new planets, galaxies, and life forms emerge in clusters of colour inside each of us. It is here that the colours define our future - the energy of cancer a magnificent red or a bravura blue. A fiery exchange inhabits all the universes – dying or thriving in the inner worlds we share. Two videos orange and the other blue. Which is Man or which is Woman? There are two videos that play together to form the artwork. The preferred method of display is for translucent screens (I can provide them) to be hung and the images to be projected on to them. This translucency allows for the images to be viewed from both sides. The two screens should hang approx.. 3 – 4 metres apart allowing movement around them. The videos emit separate soundscapes. If this set up is not practical in the gallery space then they can be projected on to a wall either side by side or on opposite sides of the room. A TV monitor does not give it the scale I feel the images need.